The 2009 Sound of Thunder Champion Harald Kitsch and a state of the art Erik Buell Racing 1190RR-B factory Superbike is a dream combination on one hand and a real nightmare on the other. When you pick up the Nr. 1 startnumber and accept to be the favorited team the world around you seperate in two halfs. There is the worldwide Buellcommunity were many of them keep the fingers crossed and truly be on your side and there are these Buellhaters who like to see you stumble and fail. The good news first: we made it, we took the victory, not only on the first, also on the second Sound of Thunder round on the Eurospeedway in the east german Lausitz. And we also not only got a first impression were the Erik Buell racing Superbike stands in relation to the Sound of Thunder Twins, we also got a first idea how Eriks new bike compete with the inline fours, because bad weather and other circumstances let many V-Twinracers stay at home, so racepromoter Art-Motor started the SoT together with the Superbikes. Well, a challenge and a chanche, but if we had a choiche it was for the first race with a brandnew bike not what we aimed for. 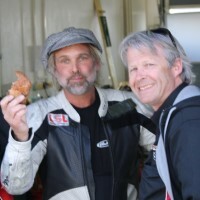 Harald Kitsch, P.R.T Sound of Thunder rider is with 30 years on the track, competing on highest levels, the right man for a complete new bike like the E.B.R 1190 RR-B. Our first tests in Alcarras / Spain were looking good, so the team was a bit enthusastic that we got a package together that can go on the podium. We headed east on Wednesday night to the Eurospeedway and after furnishing the box and a quick beer we took some sleep. Thursday we used the time for some final preparations on the bikes. The bikes for the SoT are a E.B.R 1190 RR-B with the older 2009 Buell 1125 RR bodywork and radiator setup and the Nr. 001 E.B.R 1190 RR-B Superbike in the final version with the slim bodywork and the 2010 radiator design. After rain on Thursday, the Friday start with sun and we tried to use any tracktime to understand the bikes. Harald rode turn after turn and in the evening we got first results regarding chassissetups and understanding of the a little bit tricky Dunlop tyres. Saturday the timepractice showed very quick that we are the favorites, Harald took the pole. We decided to use both bikes in the races, first for the Saturdarace the bike with the late bodywork, Sunday our idea was to use the bike with the 2009 fairing and radiators. 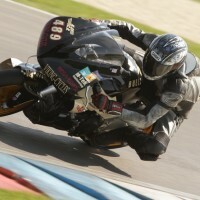 We liked to understand differences in cooling and aerodynamics of the E.B.R Superbikes. 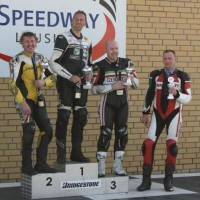 Sound of Thunder Round 1 on Saturday afternoon brought the first victory of an E.B.R 1190 RR-B, an great succes for a brand many people some month before give nothing for. It was not only a victory, Harald was dominating the with inline 4´s very good equipped field. We will see what that means for the future and the possibilities of the bike in other competitions. On Sunday the Team got the same result, second victory in the second race and also the fasdtest lap! What an impressing start for the Pegasusraceteam and Eriks new bike. The Pro Thunder class is a weight / power related (and regulated) competition. The Pegasusraceteam signed Manni Kehrmann, the 2009 european Supermono Champion, to ride a Buell 1125R in that class. In this class the bike need to compete mainly with several very quick Ducatis. Manni used the tracktime from Thursday on to find a setup of the with E.B.R equipped Showa suspension. The bike was cutting better laptimes from Turn to Turn, between Manni performed a BAS test succesful. The secod best tracktime in the practice gave us the first row and after a good start only 1 of the Ducs was able to go the speed and won in the end the race. Manni took a very good 2nd. The Sundayrace ended with a Did-Not-Finished because of a leaking gasket on the alernatorside. Well done for the first rollout! # 489 Robin Taborsky, Buell XB-R - 6. / 6. Our newcomer Robin Taborsky performed on his first Raceweekend on the Buell XB-R very well and finished both races as 6th. 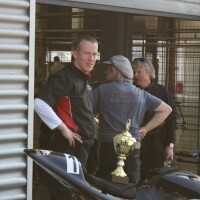 There will be now some changes on the bike to personalize it for Robin and then he need Tracktime, Tracktime and Tracktime to get familar with the power and weight of the Buell XB-R.
Over all, the Pegasusraceteam had a very succesful raceweekend. Our job for the next weeks is to prepare the bikes and gettin closer into the details of the 1190 RR-B. Thanks all the Sponsors and Buellfans worldwide who supported us in the last months. 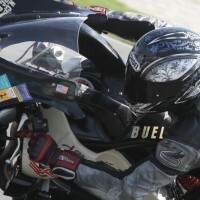 We opened a new chapter in Erik Buell Racing and we hope to see many more great results under the E.B.R brand.